L'appartamento è situato nella località STAR Schwarzwaldblick a 1000 metri di altitudine, nel cuore della Foresta Nera, in 78136 Schonach. Schonach - Un'esperienza per tutta la famiglia! Schonach è un (dal 1972 uno stato approvato) stazione climatica e centro di sport invernali nelle mitleren Foresta Nera. Inverno o estate, grandi o piccoli, Schonach offre qualcosa per tutti. Il complesso turistico "Schwarzwaldblick" si trova ai margini di Schonach, in una tranquilla collina soleggiata. La Foresta Nera e, quindi, il primo percorso si trova a pochi metri dall'appartamento. Spa 30 km di distanza. L'arrivo è possibile dal Lunedi al Sabato 16:00-19:00. La partenza deve essere lasciata libera entro le ore 10:00. Le lenzuola e gli asciugamani devono essere normalmente portati dal cliente. Se non vuoi portare lenzuola e / o asciugamani, questo non è un problema. È possibile prenotare la biancheria da letto e da bagno in loco, se lo si desidera. Costo della prenotazione della biancheria: 10 euro a persona, costo della prenotazione asciugamani: 4 euro a persona (da pagare in contanti all'arrivo). Per favore fatemi sapere al più presto possibile dopo la prenotazione se si vuole prenotare asciugamani e lenzuola per consentire a questo di essere preparati. Un massimo di 2 Animali ammessi all'interno dell'appartamento. Very nice apartment that is close to everything you might want to visit. It fit 4 adults comfortably and has a great view! I highly recommend! Such a beautiful place and Dennis made everything very easy. Will stay there again for sure and would highly recommend staying here. Very clean, wonderful view, great value! We stayed here for 3 nights with our 2 children. When we arrived we had a little trouble figuring out the parking space (it was covered in snow) but some sweet older couples helped us figure it out! Upon arrival, we were pleased at the size and cleanliness of the apartment. The size was just right, being cozy but not cramped. Everything was very neat and clean. We chose to bring our own linens, so be sure you are aware of this or you will not have towels or bedding. They are provided upon request for an additional fee. We used the kitchen and there was no lack of utensils and all appliances worked just fine. The view from the apartment was wonderful! My husband loved being able to look out and see the snow covered mountains across the valley. You can see the ski lifts from there as well. Even though it was cold and snowing, the apartment was warm upon our arrival. All rooms are equipped with radiators but we didn't need to adjust them. There are board games, books (all in German), and a nice TV with quite a few channels (again, all in German). We enjoyed coming back to the apartment to get out of the cold and relax with some hot cocoa while playing board games. 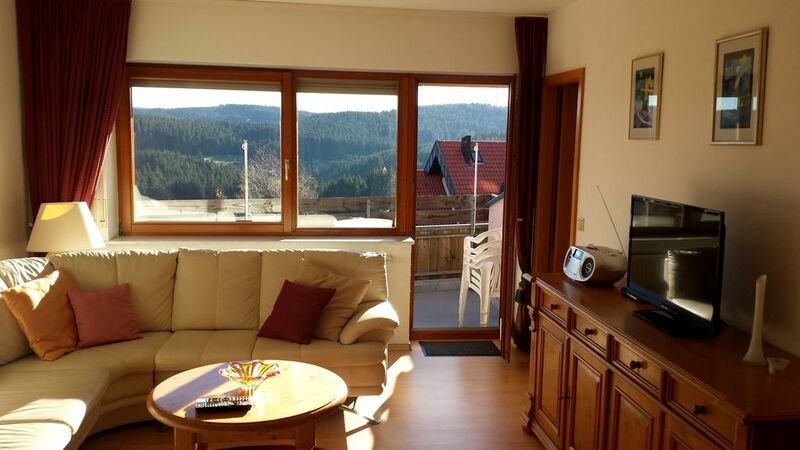 We would definitely stay here again and recommend this lovely getaway in the Schwartzwald! Anreise ist möglich von Montag bis Samstag zwischen 16:00 und 19:00 Uhr. Abreise bis 10:00 Uhr. Bettwäsche und Handtücher sind vom Gast mitzubringen. Wenn Sie keine Bettwäsche und Handtücher mitbringen möchten/können, besteht die Möglichkeit Bettwäsche und/oder Handtücher vor Ort zu buchen. Kosten für die Buchung von Bettwäsche: 10 Euro pro Person, Kosten für die Buchung von Handtücher: 4 Euro pro Person (zahlbar in bar bei Anreise). Eine Kurtaxe an die Gemeinde Schonach ist vor Ort zu zahlen und beträgt für Personen ab 16 Jahren 2,50 € inkl. MwSt. pro Aufenthaltstag und für Kinder ab 6 Jahren bis unter 16 Jahren 1,00 € inkl. MwSt. pro Aufenthaltstag.